I had the unique opportunity to be a mentor for an innovative job shadowing program for high school students in Shenzhen, China. Fourteen students from Yucai International High School flew to the Sacramento area for a two week home stay / job shadowing program. I met with 5 of these bright Chinese students this week — Shericle, Janet, Max, Jam and Harry. I had the kids brainstorm ideas for a video for my new website and present the ideas to me, as a “hands-on” marketing experience. It was a lot of fun, and the student’s ideas were very creative. To give you some more background on this program, it’s evolution, accomplishments and future, I talked with Derick, the Program Coordinator, and Elisabeth Montgomery, the Program Director. It was clear they were extremely passionate about helping the kids. The job shadowing program is unique because it breaks the pattern in China’s traditional public schools of rote learning and memorization. Students at Yucai International High School in Shenzhen China who participate in the program are encouraged to ask questions and develop their own innovative ideas. This prepares them for entry into college in the U.S. and helps them to be competitive in the global economy. Here’s a run-down of the students and their background – then I’ll show you a video of the concepts they developed and presented for my website. Shericle (Sherry) – Sherry works on the high school radio broadcasting program in China, and she’s taken a keen interest in marketing and writing. She has a natural self-confidence, is a good writer, and has an excellent command of the English language. Janet (pronounced JanNet) – Janet is an amazing character artist who captures the essentials of the person with hilarious details. She and Sherry work on the broadcasting club together. Janet is interested in the psychology of marketing and graphic / logo design. Max – Max is a bright, high-energy individual who is a marketing student in all aspects of his interests and personality. He’s intensely interested in media and the internet. He’s a quick study and is up to meet any challenge by digging in and working as a team. He attributes this cooperative spirit to his love of basketball. Jam – Jam has a sunny, kind personality and is well-loved by his classmates. Like Max, he loves sports, but he also has an intense desire to be a lawyer to uphold the rules and straighten things out. Harry – Harry is future-oriented, people oriented and driven to get things done. He has a charismatic personality that goes beyond his years and he is curious about everything. His English skills are also excellent. 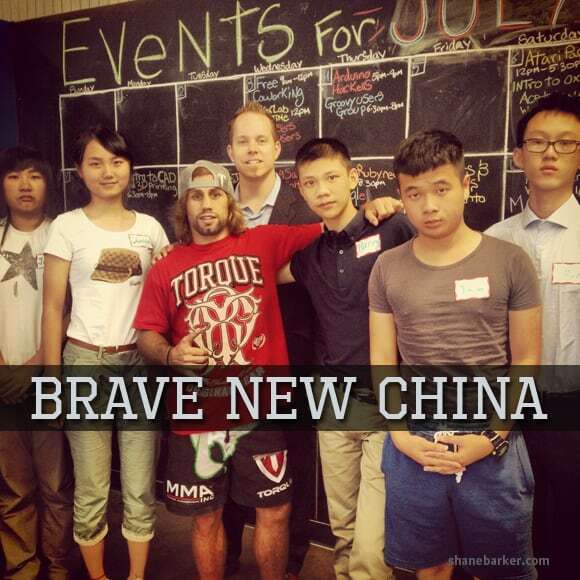 Urijah Faber, the former WEC Featherweight Champion, also stopped by to talk to the Chinese students. I want to personally thank Urijah for the time he spent offering his wisdom and experience to the students.